On average, mortgage interest rates declined in May, according to data released earlier today by the Federal Housing Finance Agency (FHFA). 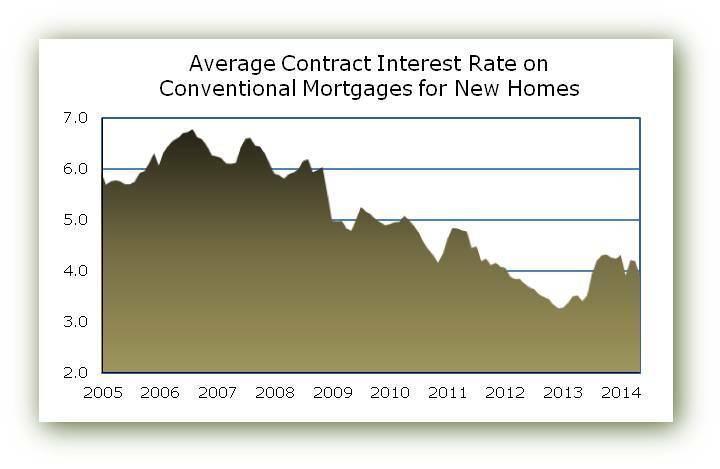 On conventional mortgages used to purchase newly-built homes, the average contract interest rate dropped by more than 30 basis points, from 4.19 to 3.88 percent. This is the lowest the new home loan rate has been in a year and the first time it has dipped below 4.0 percent since February. Initial fees increased slightly during the month, from 1.22 to 1.25 percent—far from enough to offset the decline in the contract rate. The result was an average effective rate on new home loans (which amortizes initial fees over the estimated life of the loan) that also dropped by more than 30 basis points, staying barely above 4.0 percent (at 4.01). Reversing the trend of the prior two months, the average size of conventional mortgages used to purchase new homes—and the price of the new homes purchased with the mortgages—both declined in May. The average loan size declined 1.8 percent to $319,800, while the average home price fell by 3.6 percent to $418,800. Despite the declines, both the average loan size and average new home price remain higher than they had been at any time prior to 2014. Because the change in price was greater than the change in loan size, the average loan-to-price ratio on conventional mortgages used to purchase new homes increased substantially in May, from 77.0 to 78.6 percent—the highest it’s been since last August, and the first time above 78.0 percent in 2014. This information is based on FHFA’s Monthly Interest Rate Survey (MIRS) of loans closed during the last five working days in May. For other details about the survey, see the technical note at the end of FHFA’s June 26 news release. Housing news turned positive this week as spring gave way to summer. Future data will confirm whether the recent turn in momentum reflects a return to the improving trend that was in place before the end of 2013, but early signs are encouraging. New single-family home sales reached their highest pace in six years in May. According to estimates from the Census Bureau and HUD, new home sales were at a seasonally adjusted annual rate of 504,000 in May, a gain of 18.6% over a slightly downwardly revised April (425,000). The May 2014 rate of sales is the highest since May 2008 and is a significant increase from the winter low point for sales in March (410,000). The May pace of sales was certainly an improvement over the soft patch experienced from February through April. The most recent gains are likely due to a payback for weather-related declines during the winter, so future months will indicate whether a better trend has taken hold. But encouraging signs like better jobs numbers are consistent with this outcome. Another improved indicator is the NAHB/Wells Fargo Housing Market Index (HMI), which rose four points in June to 49. This is just shy of the 50 mark, indicating at least as much optimism as pessimism among single-family home builders. The index dipped 10 points to 46 in February from a sustained above-50 mark for eight months and remained near there for four months. The June gains were experienced in all the components of the HMI: current sales, expected sales and traffic. 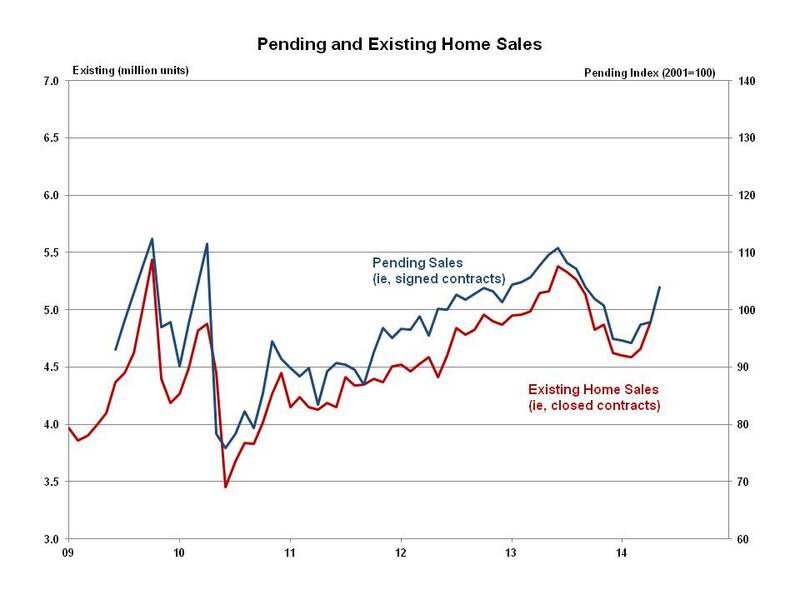 Alongside the positive new home sales report was the May existing home sales measure. The National Association of Realtors reported that existing home sales were up 4.9% from April to May. While still 5% lower year over year, the 4.89 million seasonally adjusted annual rate confirmed a turn in the decline that had been in place since the middle of 2013. Year-over-year declines in existing home sales, which distinguish this market from the growing new home market, are likely due to recent drops in distressed and investor purchases, as well as the 2014 expiration of a tax rule connected to short sales. The one negative housing report in recent weeks was construction starts. The Census Bureau and HUD estimated that total housing starts declined 6.5% in May. Single-family starts were down 5.9%, while multifamily construction in properties with five or more units was down a larger 8.3%. The declines were a result, in part, to April’s numbers, where were among the highest since the end of the recession. 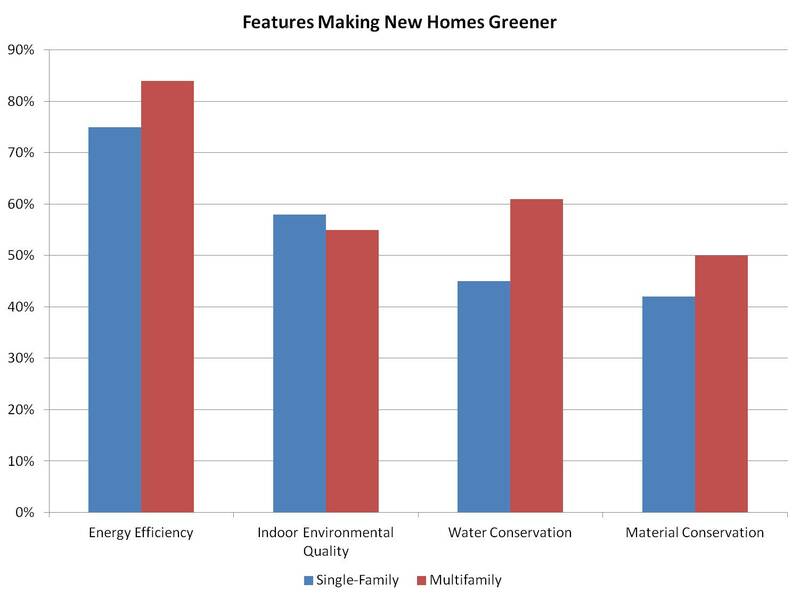 On a year-over-year basis, the May pace of single-family construction was 4.7% higher and 19.2% higher for five-plus multifamily building. Home price appreciation appears to be slowing after the strong gains of the past year or two, propelled by increases in areas that experienced some of the largest price declines during the recession. House prices grew by 10.8% between April 2013 and 2014, according to the S&P/Case-Shiller 20-City Composite Home Price Index, which was less than the 12-month growth rate of 12.4% seen in March. Similarly, the Federal Housing Finance Agency’s Purchase-Only Index rose 6% compared to 6.4% in March. Both indices show that annual house appreciation slowed from December to April and suggest the housing market may be returning to its long-run growth trend. Consistent with the weak housing reports from the winter and early spring, the final estimate of first quarter GDP indicated that the economy contracted as a 2.9% rate, the worst quarter in five years. Besides disappointing investment numbers, personal consumption growth was anemic and exports displayed particular weakness. Part of the poor performance was weather related and other one-off factors. Second quarter GDP growth should reflect some payback for deferred economic activity and post a growth rate higher than 3%. Common measures of general prices and inflation, moved in opposite directions in May. Producer prices declined 0.2%, after notable increases of 0.5% and 0.6% for March and April respectively. Among building materials, softwood lumber prices rose 1% in May from April. Prices are 28% above the average level over 2011. OSB prices have flattened out in 2014, declining 0.7% in May. 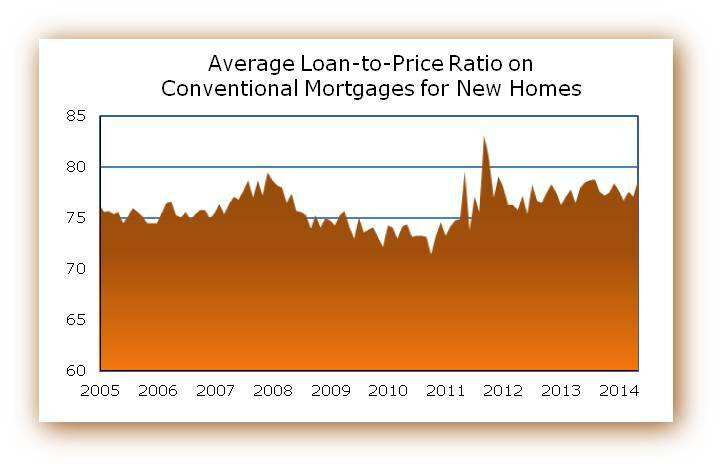 Prices are 23% above the average level over 2011. Gypsum prices declined 0.7% in May, 41% above the average 2011 mark. In contrast, consumer prices in May experienced the largest monthly increase since February 2013, rising 0.4% on a seasonally adjusted month-over-month basis and 2.1% year over year. The increase was broad, affecting many items found in the consumer basket such as energy, food and shelter. The NAHB constructed real rent index increased nominally in May. Over the past year, real rental prices rose by 1.1%. The Federal Open Market Committee, the Federal Reserve’s monetary policy committee, announced this week that the pace of asset purchases (quantitative easing) will be reduced by another $10 billion to $35 billion per month. The federal funds rate will continue to remain at the current near zero level for a “considerable time” after asset purchases have concluded. In analysis news, economists at NAHB mapped the change in county-level housing permit activity for 2013. Overall, 1,807 counties and county equivalents saw an increase in the number of single family permits issued over the prior year while 858 saw a decrease. According to data from Hanley-Wood, there was some movement among the rankings of the top ten publicly traded home builders in 2013, although D.R. Horton maintained the top spot with more than 25,000 closings. 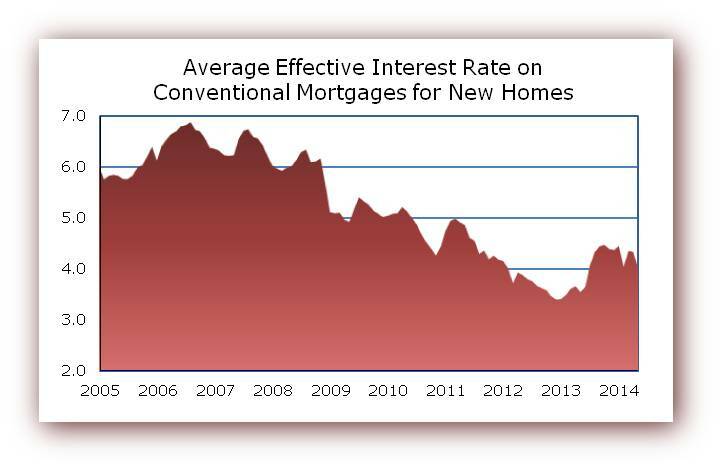 Additionally, NAHB economists discussed land banking and new mortgage application data for new homes. 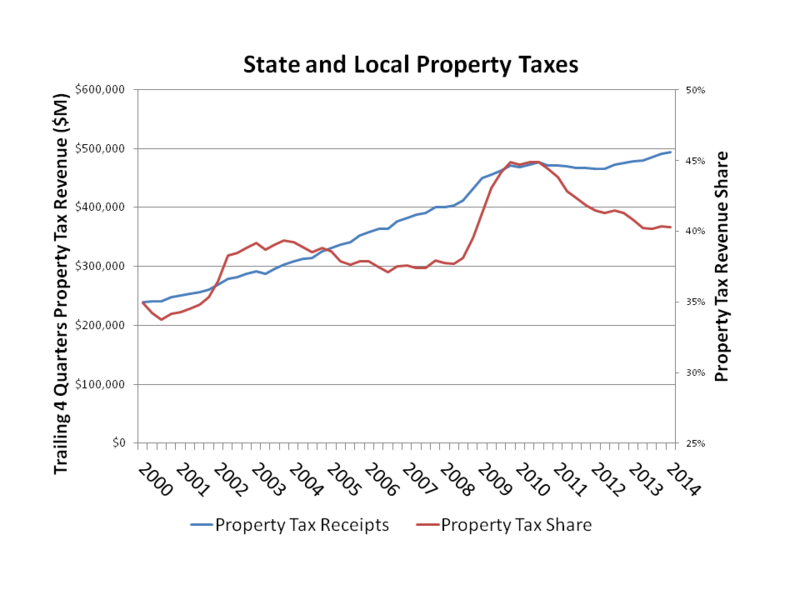 Lastly, data for the first quarter of 2014 revealed that property taxes, the top revenue source for state and local government, made up 40.3% of receipts from major sources over the last four quarters – an important reminder of the role real estate plays in local economies. Property taxes are the largest single source of state and local tax receipts, according to NAHB tabulations of the Census Bureau’s quarterly tax data. At 40.3%, property taxes represent a significantly larger share than the next largest sources: individual income taxes (28.1%) and sales taxes (27.2%). From the second quarter of 2013 through the end of the first quarter of 2014, approximately $494 billion in taxes were paid by property owners. This was a small increase from the previous trailing four-quarter $492 billion. 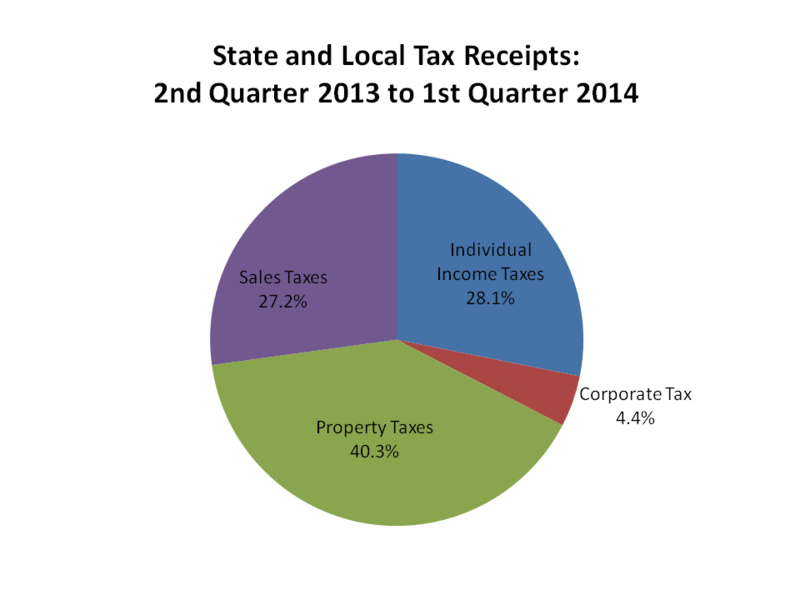 Overall, state and local revenue in the first quarter of 2014 increased $7 billion over the first quarter of 2013. There were increases in all four of the major revenue sources; property tax, state and local individual income tax, corporate income tax, and sales tax. State and local government individual income and sales tax revenue continue to experience the largest increases. From the second quarter of 2013 through the end of the first quarter of 2014, approximately $345 billion in individual income taxes were paid. This represents an increase in individual income tax revenue of nearly $20 billion or 6% from the one year ago. The increase in sales tax revenue for the same period was approximately $16 billion or 5%. Although house prices experienced healthy increases over the last two years, one should not expect property tax collections to increase significantly. Instead, lagging assessments and the ability of local jurisdiction to make annual adjustments should lead to only modest increases. The S&P/Case-Shiller House Price Index – National Index grew by 2.5% on a not seasonally adjusted basis in the fourth quarter and 10.3% last year. Property tax collections are not as prone to cyclical fluctuations as sales or income tax collections. Annual adjustments to tax rates and lagging property assessments smooth collections across business cycles. 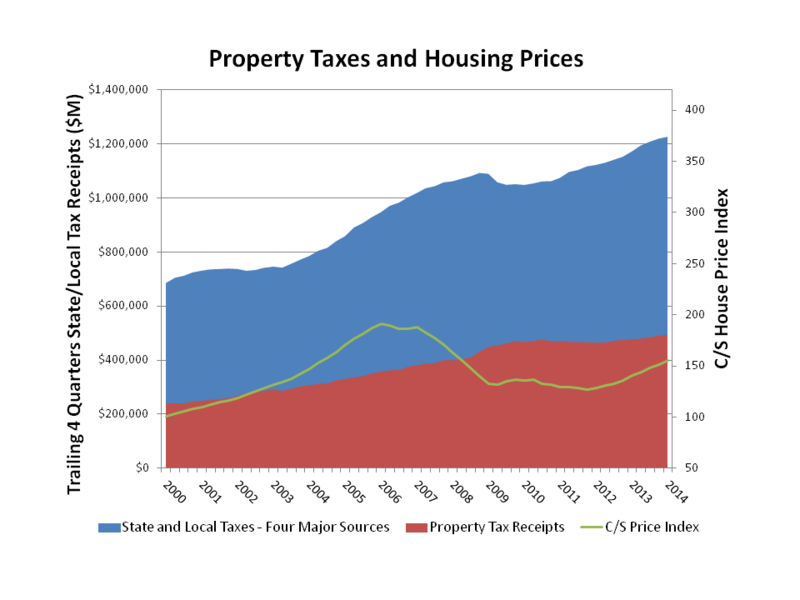 The relatively low volatility is reflected in steadily increasing nominal property tax collections. * Data footnote: Census data for property tax collections include taxes paid for all real estate assets (as well as personal property), including owner-occupied homes, rental housing, commercial real estate, and agriculture. However, housing’s share is by far the largest when considering the stock of both owner-occupied and rental housing units. 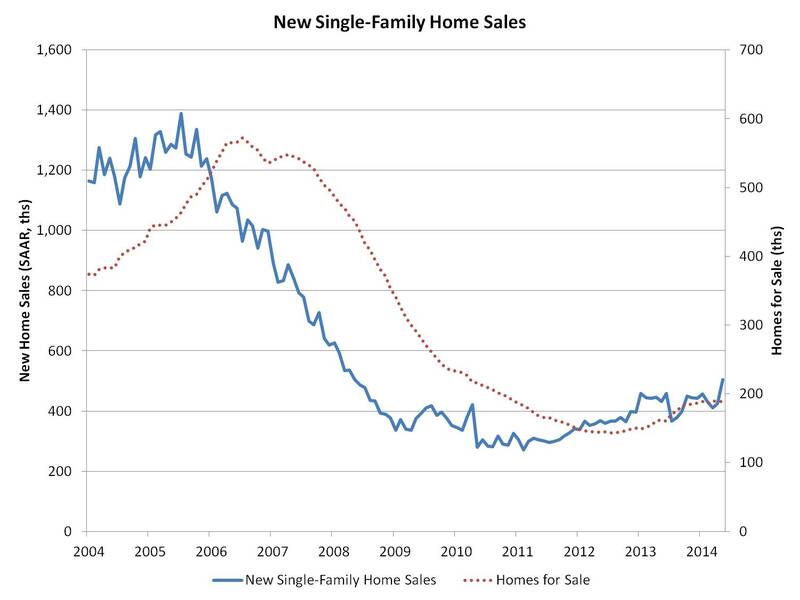 New single-family home sales reached the highest pace in six years in May. According to estimates from the Census Bureau and the Department of Housing and Urban Development, new home sales were at a seasonally adjusted annual rate of 504,000 in May, a gain of 18.6% over a slightly downwardly revised April (425,000). The May 2014 rate of sales is the highest since May of 2008 and is a significant increase from the winter low point for sales in March (410,000). The May estimates represent a return to the improving trend that has characterized the recent recovery for the single-family sector. NAHB is forecasting that single-family new home sales will total 515,000 in 2014, a nearly 20% year-over-year gain. New home inventories were flat in May, holding at the 189,000 revised level for April. Months-supply fell to 4.5 given the increase in the sales rate. Total inventory levels have remained in the 183,000 to 190,000 range since September 2013. Regionally, the pace of sales in the South increased by 14% for the month, while the West was up 34%. Gains in the South may reflect payback for prior weather-related declines, while gains in the West could be due to improving job market and economic trends. The Midwest was effectively unchanged (1.4% increase) from April but has now experienced two solid months after weaker sales figures during the wintry first quarter. Sales in the Northeast were up 54.5%. It is important to keep in mind, however, that the regional numbers have large confidence intervals around the estimates. 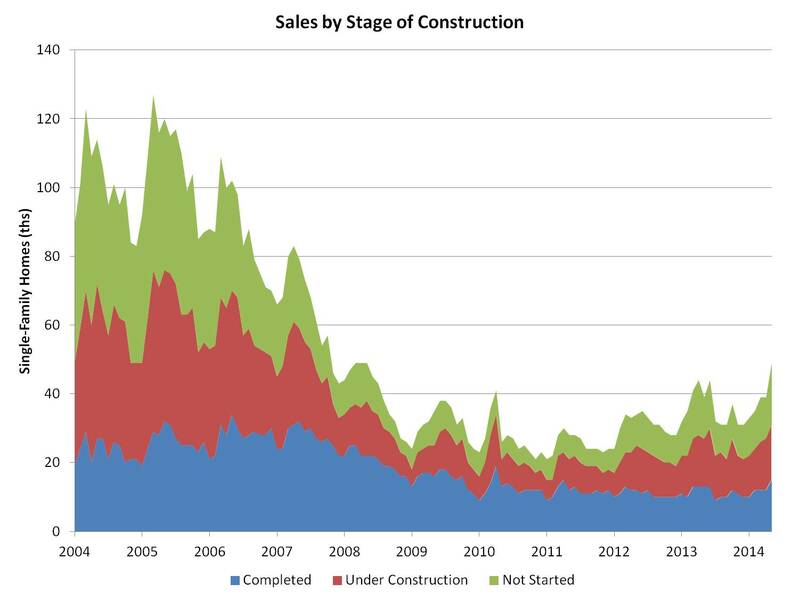 The graph above presents monthly sales totals by stage of construction. Over the last year and a half, there have been gains in sales not-started-construction and sales currently under construction. In May, there was a 50% monthly increase in sales of homes not yet begun construction, rising from 12,000 for the month to 18,000.